In the decade since the release of Episode I: The Phantom Menace, the Star Wars prequels have been the subject of much criticism, derision, and outright castigation. Even the most conscientious defenders have a hard time endorsing some of the more dubious elements, which are now immortalised alongside the acclaimed original trilogy. Indeed, the most prominent of these – the infamous character Jar Jar Binks – has entered the common lexicon as a byword for something defying all notion of good sense or sound reason. 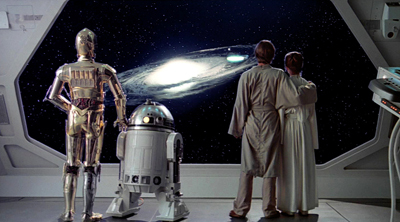 Beyond isolated elements such as this, however, there is little consensus among fans as to where and how the prequel trilogy went wrong: suffice to say that if there is no common view as to which elements are wholly detractive, it is still harder to find any agreement on those areas where positive additions were made. This has much to do with the sheer weight of expectation placed upon these three films, and one might be tempted to say that George Lucas set himself an impossible mandate the instant he re-branded the original Star Wars with the subtitle Episode IV: A New Hope back in 1981. With almost two decades having passed between this implicit promise and the period when it began to be delivered, it is hard to imagine that any film, no matter how expertly constructed, could ever hope to satisfy the lofty and divergent fantasies that an expectant audience had fostered throughout the interim. Even amidst the current industry climate of interpreting any modest reception as justification for immediately commencing production on a sequel, the Star Wars prequels seem to have erred too much on the opposite side of the equation, delivering too little too late. It is not the intent of this article to merely perpetuate the subjective argument that continues to be waged over these films, however, but rather to approach and critique them from a technical basis, and thereby attain something at least pointing toward an objective appraisal. Nitpicking and disappointment aside, the prequels still represent a deeply flawed and largely unsatisfying narrative, a large part of which stems from a single essential failure: their scope is at once too dissolute and too restricted. It may seem ridiculous to suggest that a series whose opening lines promise visions of a galaxy far, far away could ever be too big in terms of scale. Like his forebears in the world of literature, such as J.R.R. Tolkien and Frank Herbert, George Lucas created an entire universe of fictional continuity in the original Star Wars and its two sequels. A term that Lucas himself has used to express this remarkable feat is 'immaculate reality', which essentially boils down to imbuing any fictional setting with intelligible hallmarks that create and maintain a sense that it has an internal logic and implied history all of its own, and thus all the appearance of being in homogeneous existence. Think of the gritty, worn look of the Millenium Falcon and the rebel ships, the off-hand reference to Obiwan's service during the Clone Wars, or the discussion concerning the Emperor's discussion to dissolve the Galactic Senate; none of these contribute to the primary narrative, but what they achieve altogether is the sense of a living, breathing universe in which the central storyline is but an isolated strand. It is this simple attention to detail, rather than lengthy scenes of pure exposition, which creates the illusion that the world we are seeing has an existence beyond the restricted scope of what the main characters experience. Where the prequel trilogy unfortunately departs from this proven formula is in a series of needless expansions and duplications. Of the myriad examples one could cite, two should be sufficient to illustrate my point. For the first I draw your attention to the picture below, which shows two of the peripheral characters from Return of the Jedi. 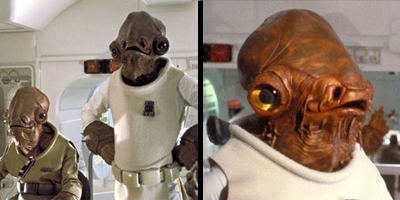 These curious creatures belong to a race called the Mon Calamari, whose resemblance to a squid reflects their aquatic origins on a world dominated by oceans, and their organic-looking spacecraft make up a significant part of the rebel fleet that attacks the second Deathstar toward the conclusion of the saga. We are given none of this information within the film itself, indeed, all we are provided with is the name of the figure on the right – Admiral Ackbar – and the fact that he is in command of the operation in question. We have no idea when this race may have joined the rebel cause, although they did not appear in either of the preceding films, nor is any explanation given as to why they did so, and this is a good thing. Those members of the audience with an inquiring mind will inevitably leave the film pleasantly engaged in musing about these matters, while casual viewers can simply discard these details without it hampering their enjoyment of the central narrative. Cast your mind forward to Attack of the Clones, the second of the prequel films, and we are introduced to an aquatic planet with another species of humanoid alien, the Kaminoans. In terms of the overall narrative, this planet and its people fulfil a fairly significant role, being the birthplace (so to speak) of the clone army whose prominent role had been implied way back in the original 1977 Star Wars. 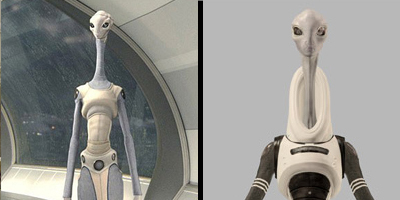 Unlike the army they produce, however, neither the Kaminoans themselves nor their watery planet are seen or heard of again. In this respect their utterly generic appearance is a perfect reflection of the arbitrary role they play within the saga. Inspiring little wonder, they are discarded as soon as their function in the narrative has been fulfilled, leaving us with the impression of a mental cul-de-sac. The universe has been expanded by an entire planet and people, and yet neither ultimately leave a compelling impression. In the interests of narrative economy, why not simply make the Mon Calamari the originators of the clone army, and thereby flesh-out an element where interest and anticipation already exist? This simple substitution would not involve changing a single thing about this part of the film in order to achieve a vastly more satisfying result. Without any additional information whatsoever, a diligent audience might reasonably infer that their appearance as a significant force in the rebellion might be an act of penance for unwittingly unleashing what proves to be a devastating force throughout the galaxy, resulting in the ascendancy of a despotic regime. Rather than two isolated appearances of different species, neither of which play another notable role within the series, a sense of continuity would thereby be maintained, provoking thought at what precisely the Mon Calamari were doing in the period between episodes II and VI. In so doing the fictional world is allowed to expand without feeling arbitrary or redundant in the process. A similar case can be made for the introduction of the planet Naboo in The Phantom Menace and its gradually lessening role in the subsequent prequels. Once again, is it necessary to invent another verdant, idyllic setting when one already existed in the form of Alderaan, having been introduced in the original film and fleetingly glimpsed in Revenge of the Sith? The fact that we are already aware of its ultimate fate in A New Hope would also add an emotional dimension, with the audience acutely aware of the fact that we are seeing a paradise destined to be callously eradicated as part of a cynical demonstration against civil disobedience. This simple substitution would also result in an entirely new depth being imbued in the scene where Darth Vader offers his implicit approval for the action, as we wonder how any man could ever been so damaged as to abet the destruction of a planet where his dearly beloved once lived. Either of these examples would have been incredibly easy to implement, and yet the reward in terms of creating pathos and compelling narrative could have been vast. It is one of the cardinal rules of writing that a good author opts to show rather than tell, and while the nature of the film medium means that showing essentially amounts to telling and vice versa, the fact that the prequel trilogy diverges from this practice nevertheless remains true. It is voyeuristic in its relentless pursuit of unnecessary scope, opting to show the audience an entire bland tapestry, whereas the original trilogy took a single strand and merely hinted, tantalisingly, at what lay beyond its fringes. At the other end of the spectrum, the prequel trilogy is also guilty of committing yet another narrative faux pas. If the setting has expanded to a gratuitous extent, then the limit in terms of central players and plot elements seems to have shrunken commensurately. By this I mean the conspicuous number of recurring characters and other apparent coincidences that stretch or defy any rational belief. What are the odds, for instance, that R2-D2 would have originally been part of the crew on a starship that belonged to Luke's mother, or that his father would have personally constructed C-3PO? Not only does the latter stretch the limits of credulity, but it also leads to the ridiculous situation whereby the comic character of episodes IV through VI was created by none other than its stoic, intimidating antagonist, Darth Vader. As such, we can only scoff at the highly improbable coincidence, bemuse ourselves with this unwelcome new consideration throughout the original trilogy, and ask ourselves what it actually adds to the narrative? Obviously the desire was to capitalise upon the pre-existing attachment to the characters established in the earlier films, but not only does this detract from that original experience, it's simply lazy writing. No-one began watching Star Wars back in 1977 with an ingrained love of R2-D2 and C-3PO, or indeed Luke, Han, Chewbacca, or Princess Leia. That appeal was earned through a combination of compelling narrative and endearing character development. With a whole galaxy of humans, droids, and aliens to choose from, there is simply no reason why figures needed to be retrospectively inserted. The resulting constriction in terms of the key players simply ends up feeling contrived and artificial, detracting from that all-important sense of immaculate reality. 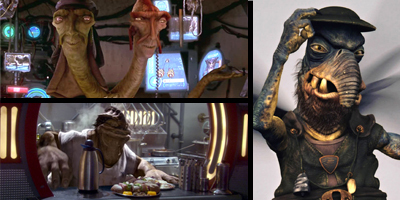 In this respect, at least, the intention behind creating a character such as Jar Jar Binks was perfectly sound, and one suspects that perhaps George Lucas acted too reflexively in response to the immediate wave of criticism and derision. It was the execution in that instance, not the underlying idea, which was defective. It is worth pointing out that not all of these character revivals were misguided, in fact many of them were absolutely crucial. A prequel trilogy virtually had to include Anakin Skywalker and the mother of his children, likewise Obiwan, Yoda, and the Emperor. Beyond these, any number of the minor cameos, such as Jabba the Hutt, Boba Fett, and Chewbacca, are perfectly reasonable and add a necessary degree of familiarity. 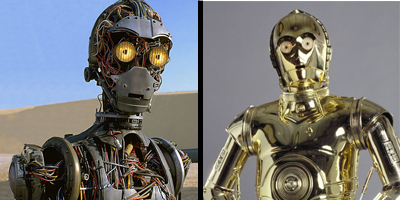 The latter, in fact, might well have played a far more pronounced role in the prequel films without attending the same disbelief evoked by the presence of R2-D2 or C-3PO, depending, of course, on how the character was woven into the central narrative. Beyond these, too much is dealt with in a fleeting, ultimately meaningless fashion. All told, it speaks either of a committee-based development wherein any slightly good idea was thrown into the mix, or an unusual measure of timidity on part of George Lucas as a writer, with the result being that virtually no enduring character was allowed to develop or grow during the entire duration of the three prequels. Quite simply, the sheer quantity of ideas present in the prequels cannot offset the dearth of quality imagination. This is perhaps most evident in the extent to which these films rely on preconceived stereotypes. No one could reasonably argue that the original Star Wars trilogy showed a particularly innovative or complex storyline. George Lucas himself has unashamedly acknowledged the extent to which his fictional universe relies upon some of the age-old stories and motifs that recur throughout world literature. The central strand is essentially a quest narrative, following the prodigal but unassuming hero from his humble origins through a journey of increasing magnitude until he eventually rights the myriad wrongs that predate his birth into that world. There are archetypes aplenty to be found, and it is this marriage between ancient narrative and innovative, imaginative presentation that is the root of its success. The aspiring innocent and the worldly rogue, the dark agent and his despotic master, the wise hermit and the threatened princess; we are conditioned from an early age to recognise all these figures, and thus react to them subliminally. While the prequels aren't entirely devoid of any trace of these archetypal characters, there is a definite move toward less polar stereotypes. The conniving politician, for instance, does not inspire the same visceral reaction as the despotic tyrant, nor the frustrated prodigy the same as the aspiring innocent. The polar opposition between freedom and oppression is also much easier to apprehend and transcendent in essence than the deft machinations of even the most straightforward double-cross. The shift from archetype to stereotype is thus at once a diminishing and a complicating one. Also, whereas archetypes tend to encompass things which are absolute in an attempt to make them codified and more easily apprehended, stereotypes tend more toward overt simplification, stripping away individual variation in an effort to demean and debase what they circumscribe. The picture above shows three examples of characters that illustrate this point. The one on the top-left is clearly meant to parody the back-and-forth style of live sports commentators, the one on the bottom-left the quintessential burly diner chef, and the one on the right the unscrupulous second-hand car dealer. There is nothing wrong with basing fantasy characters on stereotypes, and we see this practice used to good effect in films such as Men in Black, but insofar as Star Wars is concerned it marks a departure from the imaginative standards set by the original trilogy. In terms of stereotypes, perhaps the closest approximations in Episodes IV to VI would be the fascist overtones of the Imperial officers or the mafioso role played by Jabba the Hutt. Even so, had these figures been designed during the production of the prequels one cannot help but think that Jabba's face would have borne an overt resemblance to Marlon Brando, with Grand Moff Tarkin sporting a decidedly Hitleresque moustache. It sounds patently ridiculous, and that is essentially what the three characters above are equivalent to. Only when one reaches the limits of his imagination is he forced to fall back upon what is already intimately known, and the result is utterly generic figures who fulfil a narrative function rather than exist as fully independent characters. Perhaps the most succinct measure of when a fantasy narrative has failed is the point where its scale has exceeded the ability of its creator's imagination, beyond which it merely reflects the known and delivers the predictable. Whether due to creative fatigue on the part of George Lucas, or through the diluting influence of excessive input and resources, there is no question that the prequel trilogy failed to emulate the impact felt in response to the original films. Even without resorting to such loaded comparisons, the saga of episodes I through to III is plagued by narrative issues that no amount of financial investment or technical innovation could right. Proof once again, if any were needed, that a good story will overcome the limitations placed upon its telling, while no amount of anticipation will redeem a bad one.